The new millennium comes on apace (only months to go now till 2001, which as any good pedant will tell you is when the 21st century starts) and the shops are selling out of time capsules. What would you put in yours, to be dug up in a thousand years time? This was among the questions posed by Company magazine in its special 21st birthday edition (October 1999). One of the trendy young celebs they asked was Ioan Gruffudd. 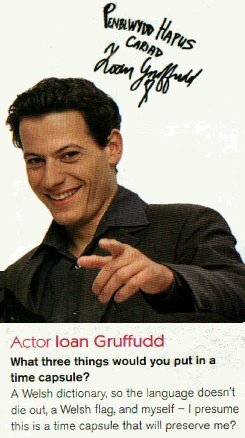 You know, Ioan Gruffudd, the dashing young Welsh actor and leading light of the Cool Cymru movement. Hes what they call a soap dish: he was in Pobol y Cwm when he was just a lad, and then went on to fame in Poldark, Hornblower, Titanic and the BBCs Great Expectations. Keep the language alive by burying a dictionary for a thousand years? Well, who knows, it might be worth a try! And there are certainly some dictionaries that have had a good innings and deserve to be laid to rest. . .
Should Gwybodiadur ask Ioan, who is famously proud of being a Welsh speaker, to be its official celebrity patron? For another novel use for Welsh dictionary, click here.